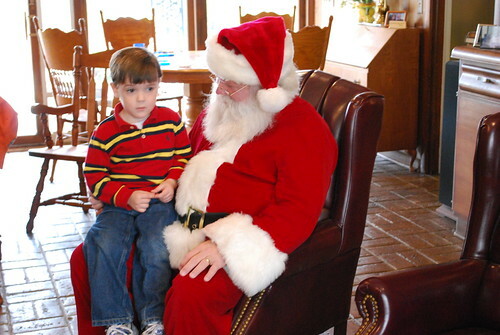 Ben was real serious in talking to Santa. 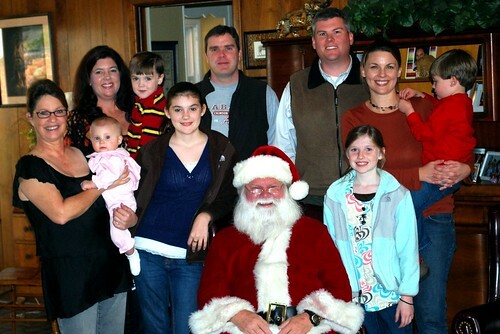 He couldn't believe his good fortune that Santa would show up at Poppy and Grammy's house! 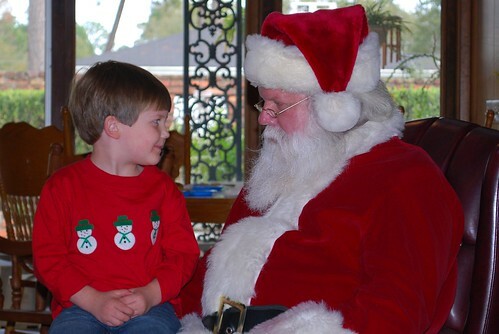 Brooks made sure he told Santa what a good little boy he has been. He knows "The Elf on the Shelf" is reporting everything to Santa and wanted to make sure nobody was getting their wires crossed! 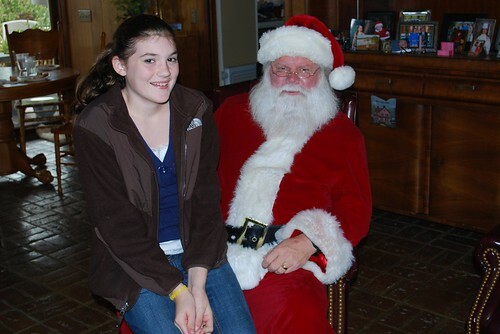 Lindsey had a few things to tell Santa but I do believe she is about to outgrow Santa's lap. Oh, lookout Mom and Dad, she is really growing up! 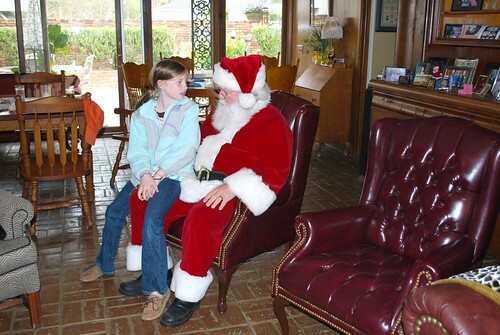 Now Leanne has really grown since Santa's visit last year. Her want list will be including a car in a few short years. My goodness, how fast they grow up! 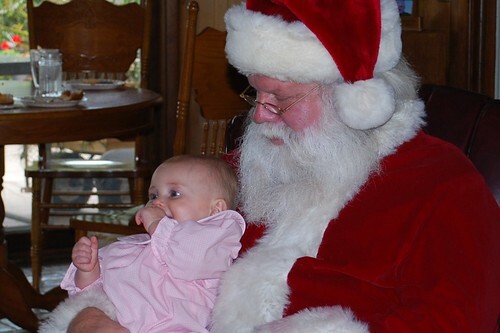 Precious little Anna Kate was all smiles for Santa. She is possibly the sweetest baby I've ever been around. Tara says she is pretty much like that all the time, unless she's hungry or really sleepy. What a little angel! 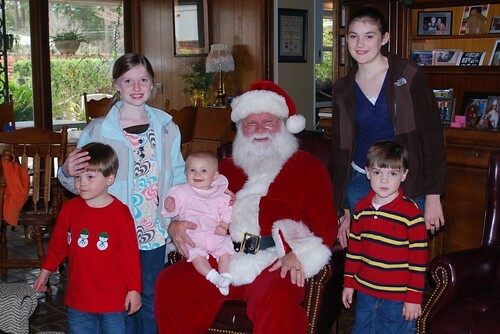 All the grandchildren with Santa! What a treasure we have here! Poppy took this picture of me with all the kids. And, of course, I got one of Poppy with all the gang! 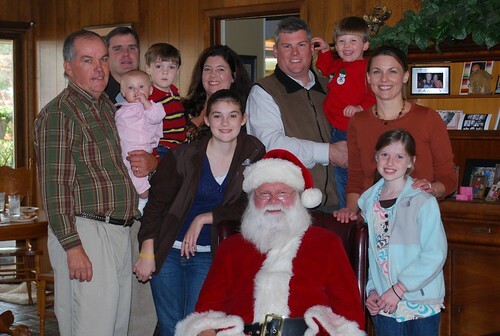 We are blessed beyond measure with these sweet children and grandchildren. Time has a way of really flying by, doesn't it? Let's all treasure the moments we are given and be thankful for each day! Jesus is the reason for the season! What a lovely family you have there! Thanks for stopping by my place and leaving a comment. What a lovely Santa! Such special memories!! Thanks for stopping by my garden. You couldn't have found a more perfect Santa. What a charming read today. Still digging out from the snow here outside Chicago, but not as bad as back east.